With a 90% chance of rain forecast for Northwest Washington, I decided to head to the east side of the state for a little cycling. 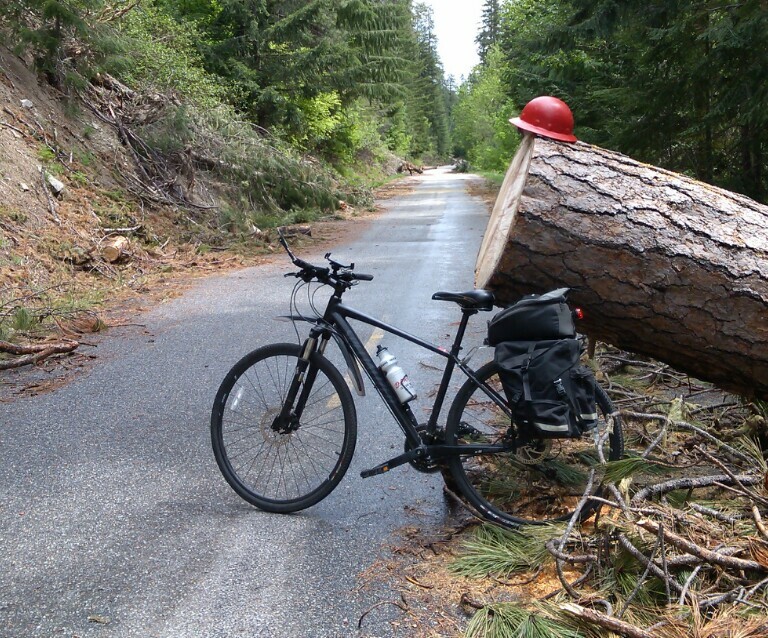 I was pedaling west on Highway 2 from Leavenworth by 10:30 yesterday morning. 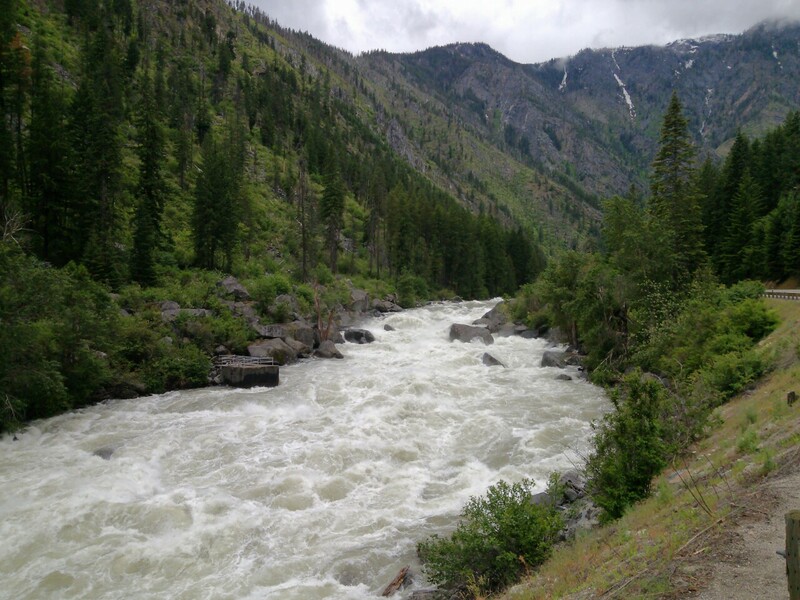 The spring snow thaw and recent rain had the Wenatchee River beside me boiling. Highway 2 follows the river through this canyon that goes miles up into the Cascade Mountains. The power of water to cut through rock can be felt and heard as one stands on the bank. I continued up towards Stevens Pass on the highway. The traffic was fairly mild as this was a Monday. As the road continued to climb up the mountain, I found a few photo op excuses to stop briefly. 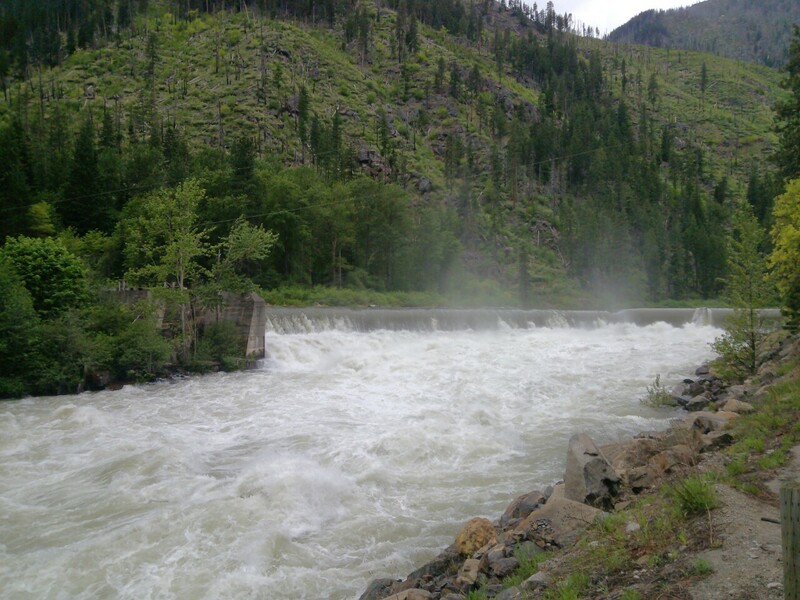 The Tumwater Dam was constructed between 1907 and 1909. At the time, it was the largest hydroelectric project west of Niagara Falls. The power it generated used to run the electric locomotives that pulled the train through the old Cascade Tunnel. So far the weather was mild but dark clouds hovered over the Cascade Mountains to the west. I left Highway 2 and headed north on Highway 207 towards Plain. I was a few miles down the road when a utility truck passed me and lost a hard hat off of the back. I picked it up and strapped in on my bike rack in hopes that I would see the work crew and be able to return it. It didn’t take long to reach the Chumstick Highway intersection that would take me to Plain. My original plan was to take the highway loop to Plain which would return me to Leavenworth. The dark clouds to the west still looked threatening but I decided to alter my route and add another 24 miles to it. This ride was the first one this year that I brought my pannier bags and some extra gear. I had extra clothing, a water filter pump, and raingear. By the end of this trek I would use all of those items. 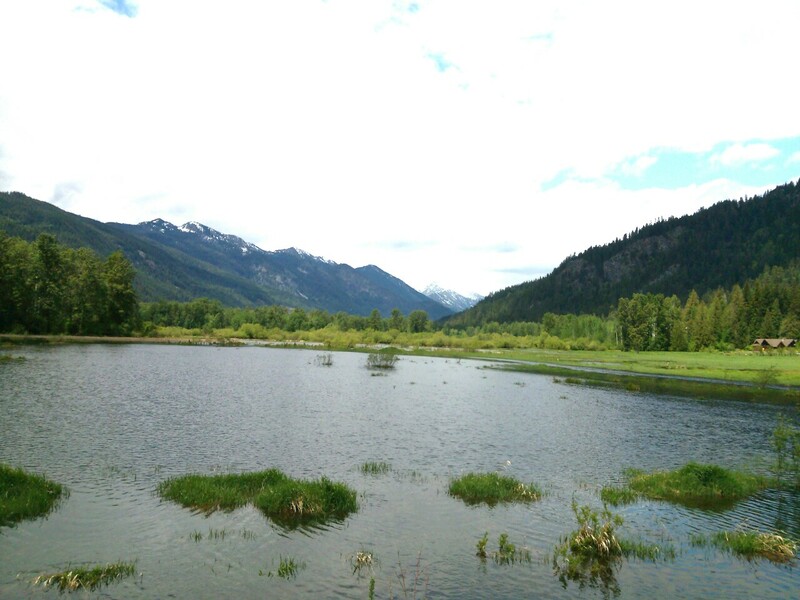 I continued on Highway 207 with Lake Wenatchee to my side. There was seldom a car to be seen and I had the snow capped mountains all around me. It was a very peaceful and enjoyable setting. I stopped at the end of the lake to snap a few photos. I pushed on around the lake to where the highway ends and National Forest road 65 began. The metal barricades were closed and a sign told of winter storm damage and trees blocking the road. This was still a paved road and I thought I would go as far as the road would allow. I ended up going approximately 10 more miles on this road. It was incredible. The sound of nature surrounded me. Over the next 90 minutes I heard nothing to remind me of civilization. Wildlife was all around me. I saw many deer, quail, squirrels, rabbits, eagles, and other animals. I found that somebody’s chainsaw work now allowed me to weave my way down the road past hundreds of fallen trees. I left the hardhat for some lucky person to find later. I stopped at one of the many roadside streams to pump some water. Once my bottles and I were full, I moved on up the road. As I had gained some elevation and got closer to those dark clouds, the temperature began to drop. I could feel that rain was inevitable. I stopped at the end of paved road where road NF 6500 begins. It was another 14 miles to Highway 2 but I knew the road was covered in snow a few miles away. I turned my steed around and headed back towards Plain. With a slight down grade to the road, I covered the ground quickly. The fact that a light rain would hit me occasionally was a good incentive to push on harder. At Lake Wenatchee, I followed the North Shore Road instead of Highway 207. This took me through many beautiful lakeside homes and cabins. By now the feel of heavy rain was in the air. I knew that at any moment it would be a downpour. I made it to cover just in time. The covered front of a little country store on Highway 207 was very welcome. I hung out with Shilo the black lab and talked with the store owner as an absolute downpour raged for 10 minutes. The rain stopped, sun broke out, and I was off again. I pushed on hard down the Chumstick Highway as the threat of more rain following me. I entered the quaint town of Plain. Evidence of early settlers was visible in the form of old log cabin structures. Plain is one of those blink and miss it places. I ground up and over the ridge that separates the valley where Plain is from Leavenworth, the sky opened up and soaked me. I found a huge old fir tree at the summit which gave me some protection from the rain. I changed clothes and donned my raincoat. I was still soaked from the waist down but knew this wouldn’t bother me. The sun broke back out for the last 10 miles of the ride. I was happy to see that this trek ended on a positive and sunny note. This day had put another 62 miles on my bike which I covered in six hours. Once I got back to the truck, I changed into some dry clothes again and headed for home. 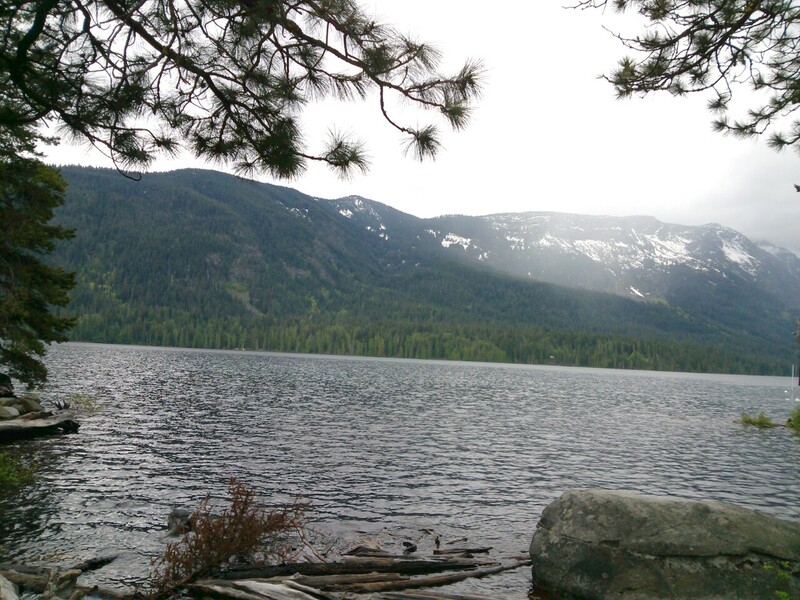 I’ll leave you with this one last photo which I took from the shores of Lake Wenatchee. That fog you see in the upper right part of the photo is the edge of the storm coming my way. This entry was posted in Bicycling, Lake Wenatchee, Leavenworth, Mountains, Photography, Plain, Washington State. Bookmark the permalink. That storm system gave us a beating on Monday on the Spokane PD range. Great travel log and your photos are looking good. “Hey, aren’t you supposed to be working”? Working through adversity makes us stronger. They surely will be even better gunslingers now. My schedule has been changed for a few weeks but thanks for making sure I wasn’t playing hooky. This is a fantastic ride, I discovered it a year ago, have done it a couple times, and recommend it to everyone who’ll listen. Looks like you’re way ahead of me, though. I think you’re better off going counter-clockwise, though. What I mean is that if you start in Leavenworth, head up the Chumstick Highway to Plain, then to Lake Wenatchee, and finally back down Route 2, it seems like a better ride. The downside is that it takes longer to lose yourself in nature, but I think the scenery is much more enjoyable in that direction, mostly the views from within Tumwater Canyon. Also, you’re going much faster on US 2 so you spend less time on the most dangerous road in the ride. The reason I took the Hwy 2 path first was that I wanted to end the ride on a more peaceful, less traffic type of a setting. 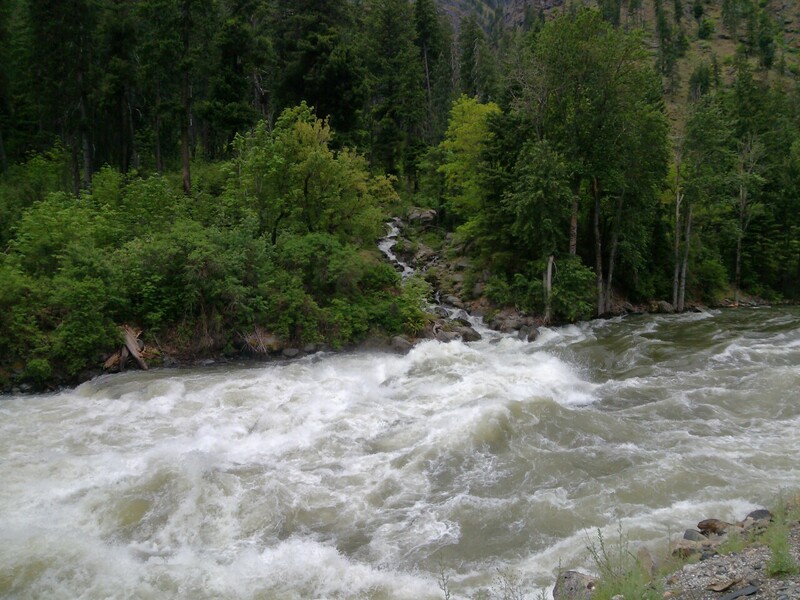 I love the scenic Wenatchee River canyon but not so much the traveling on Hwy 2. Thanks for following me. Well, you have a great reason, and I can’t argue.